We are very happy to have John Rice with us to demonstrate Landscape in Oils at our next monthly meeting on 14th May, 7:30pm at the Stan Stevens Studio, Deerubbin Centre, George St, Windsor. 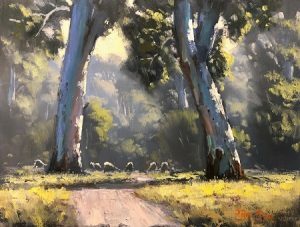 John paints almost exclusively in oils and is inspired by the strong light of the Australian landscape. He enjoys painting the landscape from life, “en plein air”, and engages in regular painting trips to country locations. John has no formal art education but learned most from getting out there and painting thousands of paintings. 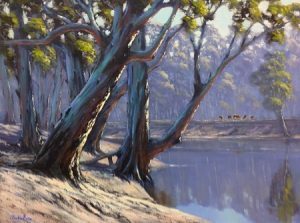 His primary influences have been the Heidleberg School of Australian impressionists and the work of Sir Hans Heysen. 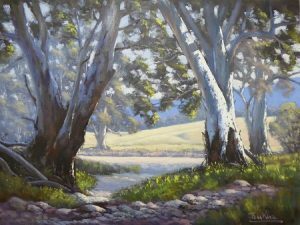 A former schoolteacher and Principal with 40 years experience, John conducts workshops and demonstrations both at his home studio in Mulgoa and for many Sydney, country and interstate art groups. He is also frequently called upon as a judge for art society exhibitions. John has won numerous awards for his work and has held 14 successful solo exhibitions. 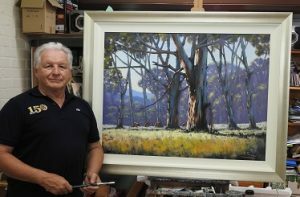 He is an exhibiting member of the Royal Art Society of NSW.